Homepage » Blog » Army Worms: Are you aware of them? Army Worms: Are you aware of them? Not sure if you've heard of these little pests, but these guys do not mess around. The adults are night-flying moths often referred to as “millers.” These moths lay eggs in masses at the crowns of grass plants and on the leaves of other plants. Some armyworm egg masses look like tiny cotton balls. The eggs hatch into a smooth, greasy-looking gray to brown caterpillars. The markings on young armyworms are indistinct, making identification of the different types of armyworms difficult. As they mature, they develop distinct lengthwise stripes. The pattern and color of these stripes identify the specific type of armyworm. After the caterpillars reach maturity, they spin their cocoon or “pupa.” Depending on the type of armyworm, there may be one or more generations during the growing season. They spend the winter in the ground as a pupa. Why are they called armyworms? It’s because they feed together and move as a group or “army” to find new sources of food. Most types, except for the Bertha armyworm, feed at night or on cloudy days, hiding under plant debris or in lawn thatch when it’s sunny out. 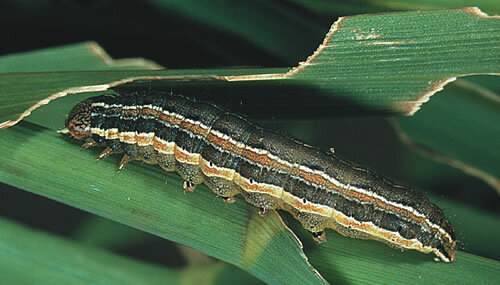 Armyworms like to feed on grass leaves and crowns. They have a preference for the more succulent, longer grass of shady areas, but that doesn’t stop them from feeding elsewhere too. The lawn develops a ragged appearance and can start to turn brown in patches. Look for circular spots or depressed areas. Damaging infestations are more likely to occur when the lawn borders crop land or large untended pastures. When more than five larvae per square foot are present and significant lawn damage from their feeding is evident, control with pesticides is warranted. A number of materials, such as carbaryl or imidacloprid, will provide control, but these materials must be labeled for use on the area you intend to treat. If you use a pesticide on your lawn, you should make sure that the product label indicates it’s safe to use on lawns. Check the label for information on rates, method of application, and precautions for safe use. To make the most effective use of the chemical, mow the lawn before treating. Follow the instructions on the label regarding watering. If none are given, water the lawn prior to treatment and then wait as long as possible after treatment to water again. If armyworms are only a problem in one section of lawn, treat only that area. If you tend to shy away from chemical pesticides, but you have a serious armyworm problem, there are some biological control methods that you can try. The bacterial insecticide, Bacillus thuringiensis (Bt) has not been very effective in the past, but there are reports that some newer forms are giving better control. Bt would only be effective on smaller, young larvae. Repeat applications may be needed, as Bt breaks down rapidly in sunlight and easily washes off grass leaves. There are also other chemicals available to commercial spray companies that provide control, including Conserve SC which is a spinosyn based material. Spinosyns are natural metabolites of a rare actinomycete bacterium. Do the armyworms have any natural enemies? Birds will feed on armyworms, but when infestations are large in number they may not be able to get rid of the entire population. Armyworms are also parasitized by braconid wasps and tachinid flies. You can help decrease armyworm populations by eliminating heavy thatch in the lawn at the appropriate time of year (in the spring.) Thatch is the daytime hiding place for these nocturnal larvae. Since armyworms lay eggs indamp areas with lush growth, elimination of these areas will also help. What about control of armyworms that find their way indoors? While armyworms are usually not harmful inside houses, they can be a distasteful nuisance, especially when they start to burrow and pupate in carpets. Control indoors is best accomplished with handpicking or vacuuming. Insecticides should not be used indoors because of the hazard they create for you... and the fact that you would still have to pick up the caterpillars or pupae once they’re dead. If large numbers are getting into the house, it probably means you should tighten up your home with caulking in areas where they can sneak in, such as around windows, doors, vents, and other openings. It is a wonderful theme for life cycle & damage. I am looking gray to brown caterpillars. As they mature, they develop distinct lengthwise stripes. Thanks. What is the season before Summer?